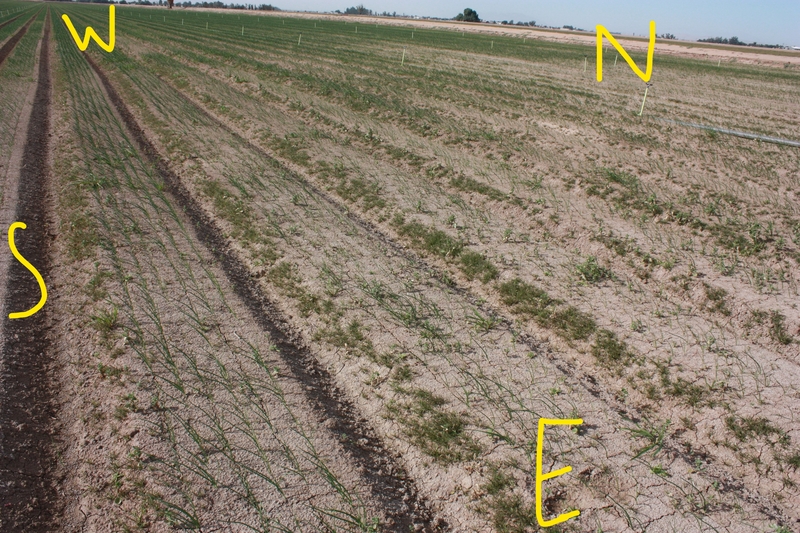 I visited an onion field where I saw this interesting emergence pattern with annual bluegrass (Poa annua L.). 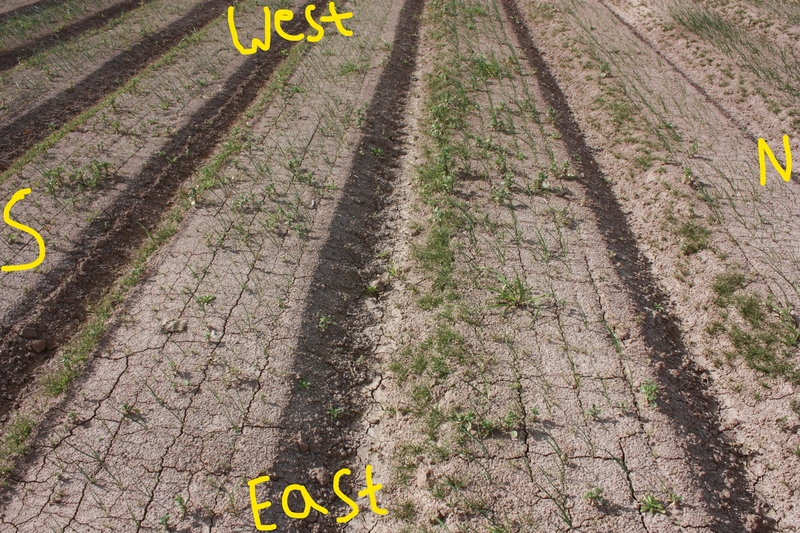 Onion beds are listed in east-west orientation (as seen in pictures). We can see annual bluegrass emergence only on the south facing slopes and none on bed-tops or north facing slopes. These pictures were taken around noon, the exact time was 12:44 PM. I assume that cultural and irrigation practices are same throughout the field. The only difference I observed was north facing slopes were shaded, but the bed tops and south facing slopes had ample light. With this situation, I am wondering what could be the possible reason for annual bluegrass to emerge on the south facing slopes but not on the bed-tops and north facing slopes. What I have understood is there are usually fewer weeds on the north-south oriented beds compared to the east-west oriented beds. It is also common to get fewer weed at bed-tops compared to the bed slopes. But the situation is different in this onion field where annual bluegrass is only on south slope. If anyone could add some information/clarification on this topic that would be great. this is an interesting pattern that i have never seen before. We published a paper over 10 years ago on seasonal emergence patterns of annual bluegrass here on the coast. Emergence seems to peak in December when days are short and the soil is wet. In the literature search for this paper we found some references to the niche of bluegrass - in winter when days are short, when soil is often saturated and there is less competition from other weeds. 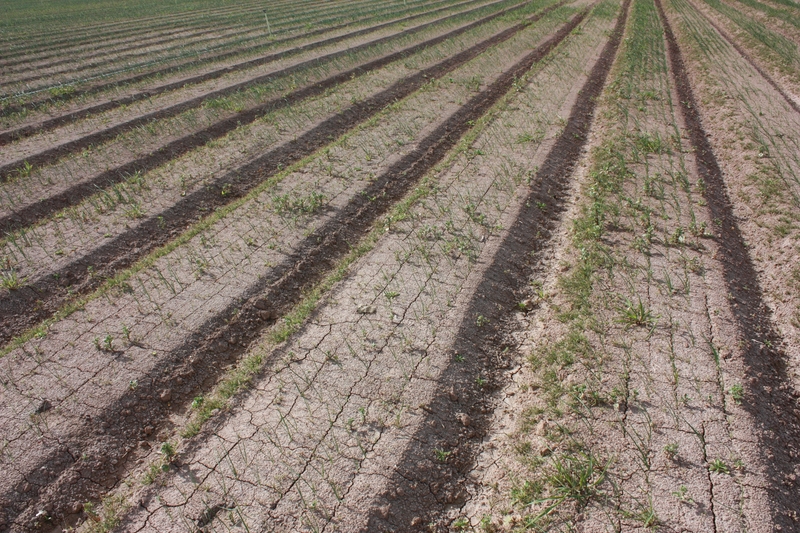 Could it be that the section of the bed where you have the most emergence is saturated for longer periods of time? Shem-Tov, S., and S. Fennimore. 2003. Seasonal changes in annual bluegrass (Poa annua L.) germinability and emergence in California. Weed Science. 51:690-695. Interesting observation. I'm going to guess that the south-facing banks are warmer, stimulating germination. Was there a herbicide appplication and was the wind blowing from the south? In the cooler months, we see our native seeds germinate first sometimes in the south rows on our bed tops. Our beds are oriented east-west and have 4 rows seeded on top. I have measured soil temperatures. The soil temps in the row furthest to the south can be 5+ degrees warmer. 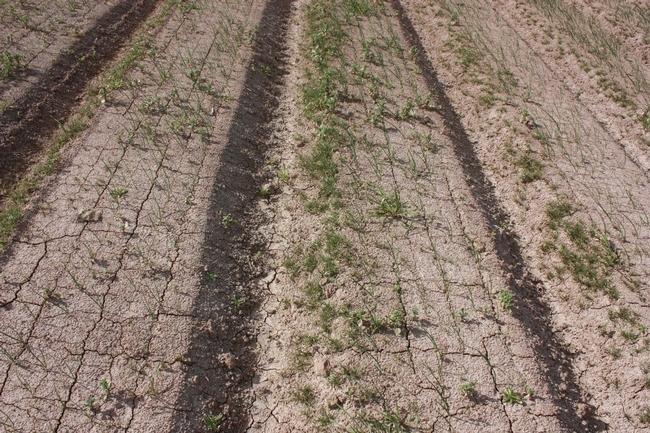 In the summer months with long days, we have seen the opposite pattern with seed germinating first in the north sides of the beds, where conditions are cooler and more favorable for germination. We have had trouble germinating anything in our fields in 95+ degree weather. If the soil is moist, the soil temps can get 10 - 20 degrees higher than the outside temp. Not good for germinating seed. Its the difference in warmth from the more direct winter sun that is low on the horizon hitting the south facing slope of the furrow. It also has a bit to do with moisture levels; the south facing slope dries out quicker, making more oxygen available to roots which encourages faster growth.